I am in love with roasted garlic. This weekend I declared, as a New Years resolution, to roast garlic way more than I did in 2011 just because IT SMELLS SO GOOD. Then I worried about what I was going to do with all the roasted garlic. But, I realized I will not have a problem using it all because IT MAKES EVERYTHING MORE DELICIOUS. Finally I was concerned that I would become exhausted from making all the roasted garlic but oh wait IT IS SO EASY AND ONLY TAKES 30 SECONDS OF WORK. Do you see a trend yet? Ah do you see how much I love roasted garlic…I totally forgot about the dip. This dip is refreshing. Yes it is cheese but the fresh ingredients add amazing flavor and lightness that you don’t often get from cheese dips. 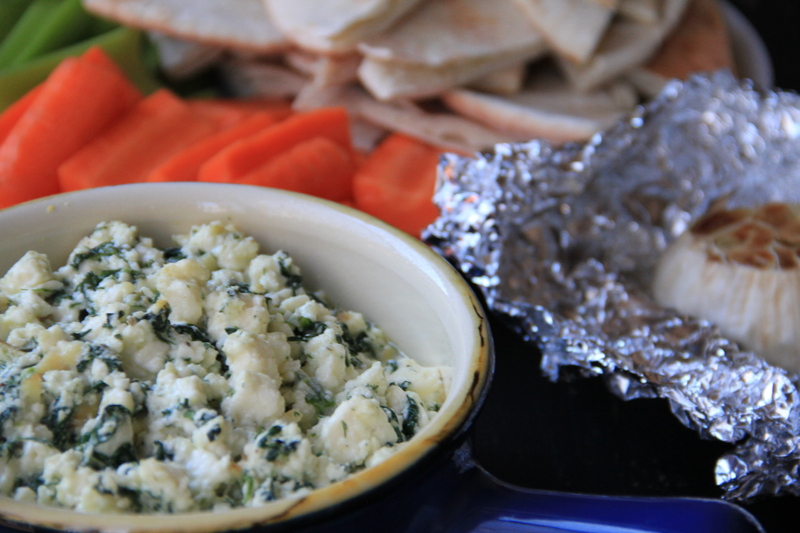 It is great served with fresh pita, pita chips, and veggies. Cut 1/4 inch off top of garlic head so you can see the tops of all the garlic cloves. Place head in foil. Pour olive oil onto the top of the cloves so it flows into all the cracks. 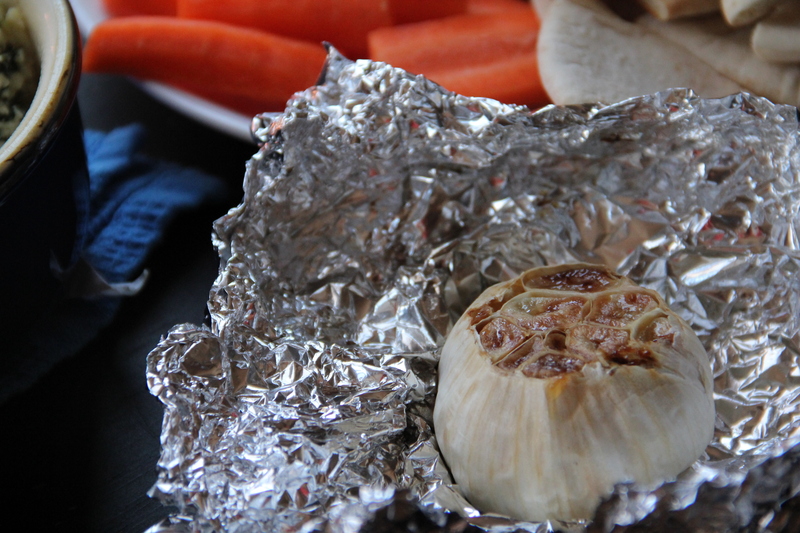 Wrap foil around the whole garlic head and put in the oven for 35-40 minutes. Mix all other ingredients together. Spray a small baking pan/dish with Pam. You can either serve the dip in a oven proof dish or bake in a baking pan (8×8 or smaller) and transfer to a bowl for serving. If using frozen spinach make sure you thaw it and squeeze out all the water. Once garlic has roasted, take out of the oven. Lower oven to 350 degrees. Let cool until you can handle it and then squeeze all the garlic out of their peels. Mix the garlic into the dip. Transfer dip to baking dish and bake for 20 minutes at 350 degrees. Drizzle with an additional tablespoon of olive oil. Enjoy! Plus, GARLIC IS GOOD FOR YOU!!!! I’m sold and now hungry!